Limco paint which is fairly common at most auto body shops but not a "consumer" brand. You can likely have a local body shop mix it up for you. It's a professional type of paint so it's not something you should fool with unless you're prepared. It is a match for my 1995 PM180 and "close enough" for my 1986 PM1150A. It has also been reported that Pittsburgh Paints "Vista Green" is an excellent match for the OLD Powermatic green. True Value Hardware stores sell "Vista Green" spray paint under their "Premium Decor" brand for those who would prefer to use a rattle can. It is a very close match to the OLD Powermatic green. From a thread on the discussion forum from "stanleyiron" Steve: I repainted a 1972 Model 60 jointer, and in doing so tracked down the only paint store (not including auto paints) in all of Denver, CO that could mix a metallic color. 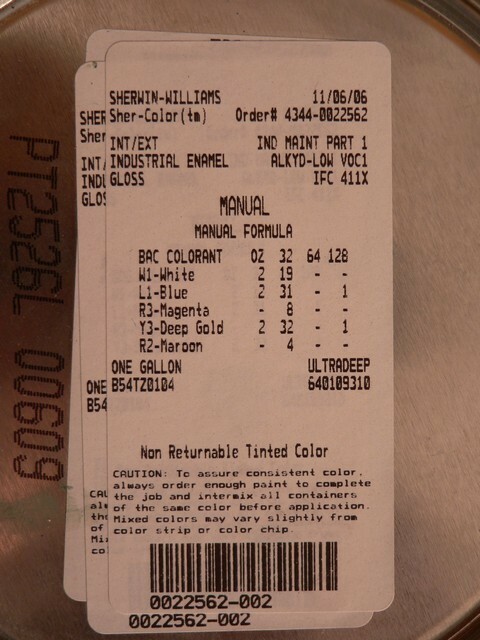 Not all Sherwin Williams location scan do this, but here's the color number I have: F75KXG92-4386. I'm no color expert, but they matched it to the underside of a part that had never seen daylight, and I think it looks fabulous. An excellent match for the 70's era metallic green is Rustoleum "hammered" #7211 Deep Green Hammered. Alternatively, Hammerite brand hammered dark green appears to be identical. The trick is to put on THIN coats. Too thick and you'll get real crappy looking "hammered" look.